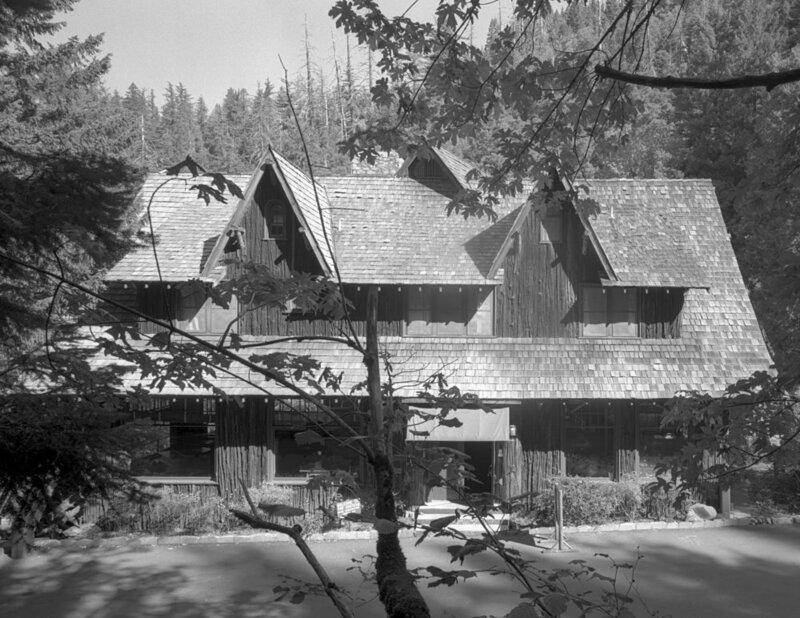 The south facade and main entrance to the lodge (under the awning). Siding is Port Orford cedar with its bark. A shed dormer is broken by two gable dormers on the upper guest room levels. Exposed wood beams of enormous size (about 18”x24”) are supported by peeled log posts (30” diameter). The interior walls are wainscoting of California Redwood heartwood with pressed fiberboard above and on the ceiling. Newer carpeting covers the original linoleum floors. Menno Kraai, general manager, sits at original Mason Monterey table and chairs. This view of the south wing from the southwest corner. The main entrance is under the awning. The central fireplace is made of marble quarried on-site during blasting and construction. Original Mason Monterey furnishings populate the space. The sprinkler system was added in 1955. This east facade and pond. The Coffee Shop was built out in 1937. A stack of chairs in the boiler room of the Chateau of the Oregon Caves. Hayward Field, University of Oregon.